One big time-saving feature of Adjace is allowing folks to update their own profile updated pictures. Here’s how it works.On the Adjace profile update page, you will see a “Select Portrait” button. 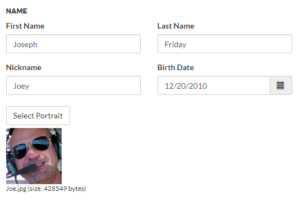 When someone selects an image, it is displayed on the form and after the profile has been updated with the new photo, the old and new photo will be displayed in your approval queue. There isn’t much to add here by way of instruction. The portrait upload is just a part of the normal profile update process. First, the household name fixer is a way for your directory to have more friendly household names without going into Planning Center and updating all of the defaults. So, the “Friday Household” becomes “Joseph and Samantha Friday.” There are important limits to how this works because we have to anticipate single parent households and adult dependents, so read the FAQs if you are wondering why it isn’t working for family X. 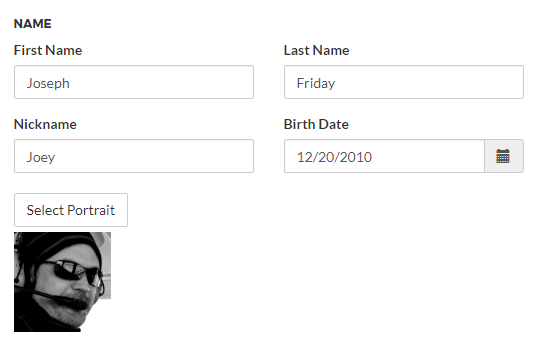 Second, the “Display Individual Portraits” option is for those churches that want to group the directory by household, but still show individual (not family) portraits. The results are a nice list of family members with individual profile pictures. Now, if you are grouping by household and still showing family portraits, we tagged the household primary with “portrait” to show that this family member is the one that will have the family’s portrait attached.